Last Wednesday, Jan. 30 at 6:37 p.m, ASUCR held its fourth meeting of the winter quarter. The meeting began with public forum. The first person to approach the podium was Chancellor Kim Wilcox. Wilcox briefly discussed the UCR 2020 plan that was laid out in 2010 with goals for the next 10 years at UCR. 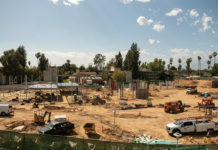 Stressing the upcoming deadline, Wilcox stated that “it is time for UCR to create a new plan for the next decade.” Within the next few weeks, UCR will be developing a planning process that will occur over a course of one to two years. Wilcox suggested that to begin this plan, students should think about what they want for UCR in a longer time frame. 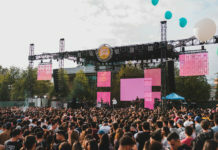 “In 2054, UCR will be a hundred years old, and what I want for us to start thinking about is this: what do we want UCR to be when it is a hundred years old? We should start this plan towards that vision,” stated Wilcox. Wilcox then allotted some time for questions from the audience or senators. CHASS Senator Alex Gonzalez brought up the issue of the STEM High School and questioned why there has not been more transparency about the issues surrounding it. Wilcox answered that the school district has not yet decided on a site and there is still time for discussion.“No decision has been made yet about where it will be going; there are no commitments other than our willingness to lease the school district our land,” said Wilcox. The Vice President of Campus Internal Affairs, Jose Cortez-Hernandez, asked Wilcox to address concerns about the possibility of loss of funding for undocumented student programs and where the funding would be going. Wilcox stated that no funding will be going away across all programs. “In fact, we have agreed on a plan that will increase funding for Costo Hall over the next several years. Part of this confusion is because there are different sources of the money and I’m trying to reassure people that regardless where the money is coming from, (Costo Hall) will be good,” stated Wilcox. Wilcox also stated that he will be hosting open office hours Feb. 8 from 1 to 2 p.m. at HUB 365 for any students that have further questions or issues that they would like to address to him directly. Continuing the public forum, Dennis Turan, the chairman of the Student Voice Committee (SVC), informed the Senate that they have finished collecting data on why students want to transfer out of UCR and offered his services for future projects. CALPIRG Coordinator Elisa Chang gave an update on the campaigns they will be running this quarter. The campaigns for winter quarter are renewable energy, affordable textbooks, littering and the Save the Bees campaign. ASUCR President Semi Cole then came up to share news from his office. Currently, he is meeting with other presidents of organizations around UCR to work on policies addressing poverty and food insecurity in the Riverside area. They are also working on a female hygiene product initiative, where free menstrual products will be provided in first-year residence halls. Along with that, ASUCR has been in contact with the company Lyft. Together with Lyft, ASCUR is looking to provide students with a limited amount of free rides per quarter. 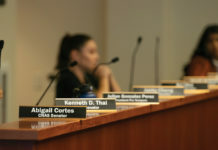 During senator reports, CHASS Senator Alyssa Tocker discussed biweekly transfer talks opening this year and working towards improving summer transfer student orientations. Tocker is currently looking for transfer students who are willing to participate in a transfer student research panel to provide advice for recent transfer students. CHASS Senator Julian Gonzalez addressed his project of trying to reduce waste in the dining halls along with taking the initiative to go and speak with all the Costo Hall programs about concerns instead of waiting for them to come to ASUCR with their concerns. The Senate then went over the elections code for the upcoming ASUCR elections. They debated whether or not they should drop the campaign funds cap to $350. This means that students running can only spend up to $250 of their personal money on their campaigns along with ASUCR covering $100 of campaign fees for all candidates. In the end the motion to cap the funds at $350 passed 10-1-0. The meeting was adjourned at 8:14 p.m. ASCUR meetings are open to the public, occurring every Wednesday at 6:30 p.m. in HUB 221.